With a rapid growth in mineral traffic at the beginning of the 20th Century, the North Eastern Railway (NER) urgently required powerful locomotives. Traffic not only consisted of coal and coke, but also limestone, ironstone, and imported ores. Most of this was in the Durham area, but traffic from the South Yorkshire collieries to Hull docks was also increasing. To solve this need, Wilson Worsdell designed his Q5 0-8-0 class to be strong and reliable. These locomotives also had to have relatively light axle loadings for the colliery track, and good steam brakes for descending the colliery inclines. The Q5 has its origins in Worsdell's B13 and B14 4-6-0 designs which were designed for heavy passenger trains. By borrowing the basic outside cylinder design from these 4-6-0 classes, Worsdell produced a simple and reliable 0-8-0. Piston valves were proving to be reliable by the time of construction in 1901, so forty of the Q5s were built with piston valves (NER Class T), whilst the remaining fifty had slide valves (NER Class T1). As has been indicated, the NER's first 0-8-0 design proved successful. When traffic continued to grow, Raven would adapt the Q5 design to produce his very successful Q6 0-8-0 design. Allocations were mainly in the Durham area, for which the Q5s were designed. Twenty were allocated to the Hull area for hauling coal from the South Yorkshire collieries to the Hull docks. The Hull allocation would be reduced in the 1920s with the last leaving the Hull area in 1935. During World War 1, all of the NER Class T1 slide valve locomotives moved to France with the Royal Engineers. All survived, and returned to duty with the NER before Grouping. Between 1932 and 1934, fourteen Q5s were fitted with 5ft 6in diameter boilers which were surplus after the withdrawal of the Hull & Barnsley Q10s. These were given the designation Q5/2. Before withdrawal, two of these would revert to their original Q5/1 state. With the purchase of large numbers of war surplus O7 WD 2-8-0 locomotives after World War 2, the withdrawal of the Q5s started at the end of 1946. The last Q5 was withdrawn in 1951. The following details are for the Q5s at Grouping in 1923. The NER Class T version had 8.75" diameter piston valves instead of slide valves. Heating Surface: Total: 1626 sq.ft. The last Q5 was withdrawn in 1951 and none survived into preservation. However as the Q5s were being withdrawn, many of their tenders were replaced old Q6 tenders. Hence, the original tender from Q5 No. 771 survives as the tender on Q6 No. 2238 which has survived into preservation. Fence Houses Model Foundry sell a kit of the Q5 for 2mm scale. 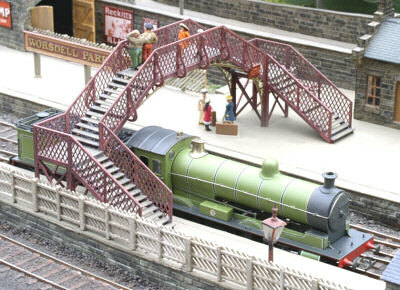 Barnfield sell a kit of the Q5 for 4mm scale. Thank you to the Rosewarne family for the photograph of LNER No. 715.